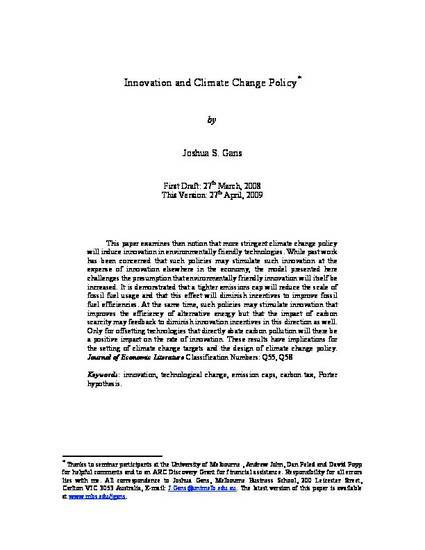 This paper examines then notion that more stringent climate change policy will induce innovation in environmentally friendly technologies. While past work has been concerned that such policies may stimulate such innovation at the expense of innovation elsewhere in the economy, the model presented here challenges the presumption that environmentally friendly innovation will be increased. It is demonstrated that a tighter emissions cap will reduce the scale of fossil fuel usage and that this effect will diminish incentives to improve fossil fuel efficiencies. At the same time, such policies may stimulate innovation that improves the efficiency of alternative energy but that the impact of carbon scarcity may feedback to diminish innovation incentives in this direction as well. Only for offsetting technologies that directly abate carbon pollution will there be a positive impact on the rate of innovation. These results have implications for the setting of climate change targets and the design of climate change policy.